While in New York I specifically hunted down the tiny little Crumpler store in SoHo to try out a potential backpack. 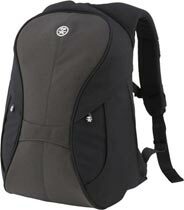 It’s of a type I’ve been wanting for a while, one which can carry my camera gear along with my laptop. The idea is to be able to carry my digital SLR almost everywhere I go; there’s no point owning a camera that stays at home. I decided on The Whickey and Cox [Crumpler photo bags], which holds a 15″ laptop (it’s actually even more spacious than needed for my 15″ Thinkpad T42p) and a significant amount of camera gear (potentially a couple bodies and a few lenses). Even though I don’t have enough camera gear to fill it up, the design is perfect for all the odd bits of electronics and other lumpy things I often carry. There’s a smaller pack (The Sinking Barge) that would hold my current camera gear and laptop just fine, but it doesn’t leave much room beyond that. When I visited the store they were currently out of the color I wanted (the sandy brown alternative is quite ugly, I’d say) so back at Kyle’s that night I ordered it online. By the time I returned from Mexico the backpack had arrived. In general it is great, I can carry most everything I usually carry plus my digitial SLR. The only thing that I sometimes carry that doesn’t fit well is books of any significant thickness. Also, the pockets that are accessible from the outside are nowhere close to as easy to use as the ones on my old backpack. The opening is so narrow and the pocket so deep that it is difficult and sometimes painful to get your hand down in there; so, there is no way you can throw small things in and expect to dig them out easily. This isn’t much of a problem since the organization inside the main compartment is so nice: there are a couple small zippered pouches, one that goes along with the laptop sleeve. I find it quite comfy to wear. The back is a bit more padded than my old backpack and yet it is still quite stiff because the laptop sits right there. My old backpack from Spire holds the laptop further from your back but has a stiff plastic sheet conforming to your back which I have grown to really like. The stiff back makes the pack quite confortable and solid no matter what you put in it, and I was worried I would miss that in the Crumpler bag. But, on the whole, the Crumpler bag turns out to be a more rigid pack thanks to the foam lined camera compartment and the location of the laptop. For the record, my old backpack is an early version of the Spire Meta, which I still highly recommend. As far as I know, it is the only backpack short of a true hiking pack that has a waist belt designed to carry a substantial load. It also has two very nice handles, one on top and one on the side that are far better than the usual loop of fabric. Also, it expands and contracts well; I can stuff it with clothes for a trip or sinch down some straps and go to work with just a few papers and a laptop in a sleek package.